The Dead Sea (Hebrew: יָם הַמֶּלַח Yam ha-Melah lit. Sea of Salt; Arabic: البحر الميت‎ Al-Bahr al-Mayyit) is a salt lake bordered by Jordan to the east and Israel and the West Bank to the west. It lies in the Jordan Rift Valley, and its main tributary is the Jordan River. Its surface and shores are 430.5 metres (1,412 ft) below sea level, Earth's lowest elevation on land. It is 304 m (997 ft) deep, the deepest hypersaline lake in the world. With a salinity of 342 g/kg, or 34.2% (in 2011), it is one of the world's saltiest bodies of water – 9.6 times as salty as the ocean – and has a density of 1.24 kg/litre, which makes swimming similar to floating. This salinity makes for a harsh environment in which plants and animals cannot flourish, hence its name. The Dead Sea's main, northern basin is 50 kilometres (31 mi) long and 15 kilometres (9 mi) wide at its widest point. The Dead Sea has attracted visitors from around the Mediterranean Basin for thousands of years. It was one of the world's first health resorts (for Herod the Great), and it has been the supplier of a wide variety of products, from asphalt for Egyptian mummification to potash for fertilisers. The Dead Sea is receding at an alarming rate; its surface area today is 605 km2 (234 sq mi), having been 1,050 km2 (410 sq mi) in 1930. The recession of the Dead Sea has begun causing problems, and multiple canals and pipelines proposals exist to reduce its recession. One of these proposals is the Red Sea–Dead Sea Water Conveyance project, carried out by Jordan, which will provide water to neighbouring countries, while the brine will be carried to the Dead Sea to help stabilise its water level. The first phase of the project is scheduled to begin in 2018 and be completed in 2021. In Hebrew, the Dead Sea is Yām ha-Melaḥ (help·info) (ים המלח), meaning "sea of salt" (Genesis 14:3). The Bible uses this term alongside two others: the Sea of the Arabah (Yām ha-‘Ărāvâ ים הערבה), and the Eastern Sea (Yām ha-Mizraḥî ים המזרחי). The designation "Dead Sea" never appears in the Bible. In prose sometimes the term Yām ha-Māvet (ים המוות, "sea of death") is used, due to the scarcity of aquatic life there. In Arabic the Dead Sea is called al-Bahr al-Mayyit (help·info) ("the Dead Sea"), or less commonly baḥrᵘ lūṭᵃ (بحر لوط, "the Sea of Lot"). Another historic name in Arabic was the "Sea of Zoʼar", after a nearby town in biblical times. The Greeks called it Lake Asphaltites (Attic Greek ἡ Θάλαττα ἀσφαλτῖτης, hē Thálatta asphaltĩtēs, "the Asphaltite sea"). The Dead Sea is an endorheic lake located in the Jordan Rift Valley, a geographic feature formed by the Dead Sea Transform (DST). This left lateral-moving transform fault lies along the tectonic plate boundary between the African Plate and the Arabian Plate. It runs between the East Anatolian Fault zone in Turkey and the northern end of the Red Sea Rift offshore of the southern tip of Sinai. It is here that the Upper Jordan River/Sea of Galilee/Lower Jordan River water system comes to an end. The Mujib River, biblical Arnon, is one of the larger water sources of the Dead Sea other than the Jordan. The Wadi Mujib valley, 420 m below the sea level in the southern part of the Jordan valley, is a biosphere reserve, with an area of 212 km2 (82 sq mi). Other more substantial sources are Wadi Darajeh (Arabic)/Nahal Dragot (Hebrew), and Nahal Arugot. Wadi Hasa (biblical Zered) is another wadi flowing into the Dead Sea. To the west of the Dead Sea, the Judaean mountains rise less steeply and are much lower than the mountains to the east. Along the southwestern side of the lake is a 210 m (700 ft) tall halite formation called "Mount Sodom". There are two contending hypotheses about the origin of the low elevation of the Dead Sea. The older hypothesis is that the Dead Sea lies in a true rift zone, an extension of the Red Sea Rift, or even of the Great Rift Valley of eastern Africa. A more recent hypothesis is that the Dead Sea basin is a consequence of a "step-over" discontinuity along the Dead Sea Transform, creating an extension of the crust with consequent subsidence. Around 3.7 million years ago, what is now the valley of the Jordan River, Dead Sea, and the northern Wadi Arabah was repeatedly inundated by waters from the Mediterranean Sea. The waters formed in a narrow, crooked bay that is called by geologists the Sedom Lagoon, which was connected to the sea through what is now the Jezreel Valley. The floods of the valley came and went depending on long-scale climate change. The Sedom Lagoon deposited beds of salt that eventually became 2.5 km (1.55 mi) thick. Approximately two million years ago, the land between the Rift Valley and the Mediterranean Sea rose to such an extent that the ocean could no longer flood the area. Thus, the long lagoon became a landlocked lake. The Sedom Lagoon extended at its maximum from the Sea of Galilee in the north to somewhere around 50 km (30 mi) south of the current southern end of the Dead Sea, and the subsequent lakes obviously never surpassed this expanse. The Hula Depression was never part of any of these water bodies due to its higher elevation and the high threshold of the Korazim block separating it from the Sea of Galilee basin. The first prehistoric lake to follow the Sedom Lagoon is named Lake Amora, followed by Lake Lisan and finally by the Dead Sea. The water levels and salinity of these lakes have either risen or fallen as an effect of the tectonic dropping of the valley bottom, and due to climate variation. As the climate became more arid, Lake Lisan finally shrank and became saltier, leaving the Dead Sea as its last remainder. In prehistoric times, great amounts of sediment collected on the floor of Lake Amora. The sediment was heavier than the salt deposits and squeezed the salt deposits upwards into what are now the Lisan Peninsula and Mount Sodom (on the southwest side of the lake). Geologists explain the effect in terms of a bucket of mud into which a large flat stone is placed, forcing the mud to creep up the sides of the bucket. 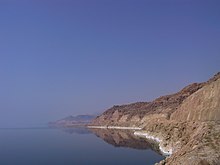 When the floor of the Dead Sea dropped further due to tectonic forces, the salt mounts of Lisan and Mount Sodom stayed in place as high cliffs (see salt dome). From 70,000 to 12,000 years ago, the lake's level was 100 m (330 ft) to 250 m (820 ft) higher than its current level. This lake, Lake Lisan, fluctuated dramatically, rising to its highest level around 26,000 years ago, indicating a very wet climate in the Near East. Around 10,000 years ago, the lake's level dropped dramatically, probably even lower than today. During the last several thousand years, the lake has fluctuated approximately 400 m (1,300 ft), with some significant drops and rises. Current theories as to the cause of this dramatic drop in levels rule out volcanic activity; therefore, it may have been a seismic event. The Dead Sea's climate offers year-round sunny skies and dry air. It has less than 50 millimetres (2 in) mean annual rainfall and a summer average temperature between 32 and 39 °C (90 and 102 °F). Winter average temperatures range between 20 and 23 °C (68 and 73 °F). The region has weaker ultraviolet radiation, particularly the UVB (erythrogenic rays). Given the higher atmospheric pressure, the air has a slightly higher oxygen content (3.3% in summer to 4.8% in winter) as compared to oxygen concentration at sea level. Barometric pressures at the Dead Sea were measured between 1061 and 1065 hPa and clinically compared with health effects at higher altitude. (This barometric measure is about 5% higher than sea level standard atmospheric pressure of 1013.25 hPa, which is the global ocean mean or ATM.) The Dead Sea affects temperatures nearby because of the moderating effect a large body of water has on climate. During the winter, sea temperatures tend to be higher than land temperatures, and vice versa during the summer months. This is the result of the water's mass and specific heat capacity. On average, there are 192 days above 30 °C (86 °F) annually. With 34.2% salinity (in 2011), it is one of the world's saltiest bodies of water, though Lake Vanda in Antarctica (35%), Lake Assal in Djibouti (34.8%), Lagoon Garabogazköl in the Caspian Sea (up to 35%) and some hypersaline ponds and lakes of the McMurdo Dry Valleys in Antarctica (such as Don Juan Pond (44%)) have reported higher salinities. Until the winter of 1978–79, when a major mixing event took place, the Dead Sea was composed of two stratified layers of water that differed in temperature, density, age, and salinity. The topmost 35 meters (115 ft) or so of the Dead Sea had an average salinity of 342 parts per thousand (in 2002), and a temperature that swung between 19 °C (66 °F) and 37 °C (99 °F). Underneath a zone of transition, the lowest level of the Dead Sea had waters of a consistent 22 °C (72 °F) temperature and complete saturation of sodium chloride (NaCl). Since the water near the bottom is saturated, the salt precipitates out of solution onto the sea floor. The mineral content of the Dead Sea is very different from that of ocean water. The exact composition of the Dead Sea water varies mainly with season, depth and temperature. In the early 1980s, the concentration of ionic species (in g/kg) of Dead Sea surface water was Cl− (181.4), Br− (4.2), SO42− (0.4), HCO3− (0.2), Ca2+ (14.1), Na+ (32.5), K+ (6.2) and Mg2+ (35.2). The total salinity was 276 g/kg. These results show that the composition of the salt, as anhydrous chlorides on a weight percentage basis, was calcium chloride (CaCl2) 14.4%, potassium chloride (KCl) 4.4%, magnesium chloride (MgCl2) 50.8% and sodium chloride (NaCl) 30.4%. In comparison, the salt in the water of most oceans and seas is approximately 85% sodium chloride. The concentration of sulfate ions (SO42−) is very low, and the concentration of bromide ions (Br−) is the highest of all waters on Earth. An unusual feature of the Dead Sea is its discharge of asphalt. From deep seeps, the Dead Sea constantly spits up small pebbles and blocks of the black substance. Asphalt-coated figurines and bitumen-coated Neolithic skulls from archaeological sites have been found. Egyptian mummification processes used asphalt imported from the Dead Sea region. The Dead Sea area has become a location for health research and potential treatment for several reasons. The mineral content of the water, the low content of pollens and other allergens in the atmosphere, the reduced ultraviolet component of solar radiation, and the higher atmospheric pressure at this great depth each may have specific health effects. For example, persons experiencing reduced respiratory function from diseases such as cystic fibrosis seem to benefit from the increased atmospheric pressure. Climatotherapy at the Dead Sea may be a therapy for psoriasis by sunbathing for long periods in the area due to its position below sea level and subsequent result that UV rays are partially blocked by the increased cloud cover over the Dead Sea. Rhinosinusitis patients receiving Dead Sea saline nasal irrigation exhibited improved symptom relief compared to standard hypertonic saline spray in one study. In times of flood, the salt content of the Dead Sea can drop from its usual 35% to 30% or lower. The Dead Sea temporarily comes to life in the wake of rainy winters. In 1980, after one such rainy winter, the normally dark blue Dead Sea turned red. 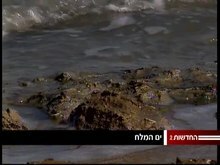 Researchers from Hebrew University of Jerusalem found the Dead Sea to be teeming with a type of alga called Dunaliella. Dunaliella in turn nourished carotenoid-containing (red-pigmented) halobacteria, whose presence caused the color change. Since 1980, the Dead Sea basin has been dry and the algae and the bacteria have not returned in measurable numbers. In 2011 a group of scientists from Be'er Sheva, Israel and Germany discovered fissures in the floor of the Dead Sea by scuba diving and observing the surface. These fissures allow fresh and brackish water to enter the Dead Sea. They sampled biofilms surrounding the fissures and discovered numerous species of bacteria and archaea. Many animal species live in the mountains surrounding the Dead Sea. Hikers can see ibex, hares, hyraxes, jackals, foxes, and even leopards. Hundreds of bird species inhabit the zone as well. Both Jordan and Israel have established nature reserves around the Dead Sea. There are several small communities near the Dead Sea. These include Ein Gedi, Neve Zohar and the Israeli settlements in the Megilot Regional Council: Kalya, Mitzpe Shalem and Avnat. There is a nature preserve at Ein Gedi, and several Dead Sea hotels are located on the southwest end at Ein Bokek near Neve Zohar. Highway 90 runs north-south on the Israeli side for a total distance of 565 km (351 mi) from Metula on the Lebanese border in the north to its southern terminus at the Egyptian border near the Red Sea port of Eilat. Potash City is a small community on the Jordanian side of the Dead Sea, and others including Suweima. Highway 65 runs north-south on the Jordanian side from near Jordan's northern tip down past the Dead Sea to the port of Aqaba. Dwelling in caves near the Dead Sea is recorded in the Hebrew Bible as having taken place before the Israelites came to Canaan, and extensively at the time of King David. Just northwest of the Dead Sea is Jericho. Somewhere, perhaps on the southeastern shore, would be the cities mentioned in the Book of Genesis which were said to have been destroyed in the time of Abraham: Sodom and Gomorra (Genesis 18) and the three other "Cities of the Plain", Admah, Zeboim and Zoar (Deuteronomy 29:23). Zoar escaped destruction when Abraham's nephew Lot escaped to Zoar from Sodom (Genesis 19:21–22). Before the destruction, the Dead Sea was a valley full of natural tar pits, which was called the vale of Siddim. King David was said to have hidden from Saul at Ein Gedi nearby. In Ezekiel 47:8–9 there is a specific prophecy that the sea will "be healed and made fresh", becoming a normal lake capable of supporting marine life. A similar prophecy is stated in Zechariah 14:8, which says that "living waters will go out from Jerusalem, half of them to the eastern sea [likely the Dead Sea] and half to the western sea [the Mediterranean]." The Dead Sea was an important trade route with ships carrying salt, asphalt and agricultural produce. Multiple anchorages existed on both sides of the sea, including in Ein Gedi, Khirbet Mazin (where the ruins of a Hasmonean-era dry dock are located), Numeira and near Masada. King Herod the Great built or rebuilt several fortresses and palaces on the western bank of the Dead Sea. The most famous was Masada, where in 70 CE a small group of Jewish zealots fled after the fall of the destruction of the Second Temple. The zealots survived until 73 CE, when a siege by the X Legion ended in the deaths by suicide of its 960 inhabitants. Another historically important fortress was Machaerus (מכוור), on the eastern bank, where, according to Josephus, John the Baptist was imprisoned by Herod Antipas and died. 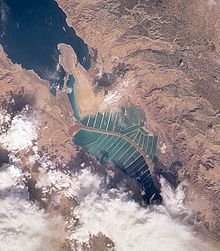 Josephus identified the Dead Sea in geographic proximity to the ancient Biblical city of Sodom. However, he referred to the lake by its Greek name, Asphaltites. Various sects of Jews settled in caves overlooking the Dead Sea. The best known of these are the Essenes of Qumran, who left an extensive library known as the Dead Sea Scrolls. The town of Ein Gedi, mentioned many times in the Mishna, produced persimmon for the temple's fragrance and for export, using a secret recipe. "Sodomite salt" was an essential mineral for the temple's holy incense, but was said to be dangerous for home use and could cause blindness. The Roman camps surrounding Masada were built by Jewish slaves receiving water from the towns around the lake. These towns had drinking water from the Ein Feshcha springs and other sweetwater springs in the vicinity. Intimately connected with the Judean wilderness to its northwest and west, the Dead Sea was a place of escape and refuge. The remoteness of the region attracted Greek Orthodox monks since the Byzantine era. Their monasteries, such as Saint George in Wadi Kelt and Mar Saba in the Judaean Desert, are places of pilgrimage. The southern basin of the Dead Sea as of 1817-18, with the Lisan Peninsula and its ford (now named Lynch Strait). North is to the right. In the 19th century the River Jordan and the Dead Sea were explored by boat primarily by Christopher Costigan in 1835, Thomas Howard Molyneux in 1847, William Francis Lynch in 1848, and John MacGregor in 1869. The full text of W. F. Lynch's 1949 book Narrative of the United States' Expedition to the River Jordan and the Dead Sea is available online. Charles Leonard Irby and James Mangles travelled along the shores of the Dead Sea already in 1817–18, but didn't navigate on its waters. Explorers and scientists arrived in the area to analyze the minerals and research the unique climate. After the find of the "Moabite Stone" in 1868 on the plateau east of the Dead Sea, Moses Wilhelm Shapira and his partner Salim al-Khouri forged and sold a whole range of presumed "Moabite" antiquities, and in 1883 Shapira presented what is now known as the "Shapira Strips", a supposedly ancient scroll written on leather strips which he claimed had been found near the Dead Sea. The strips were declared to be forgeries and Shapira took his own life in disgrace. In the late 1940s and early 1950s, hundreds of religious documents dated between 150 BCE and 70 CE were found in caves near the ancient settlement of Qumran, about one mile (1.6 kilometres) inland from the northwestern shore of the Dead Sea (presently in the West Bank). They became known and famous as the Dead Sea Scrolls. The world's lowest roads, Highway 90, run along the Israeli and West Bank shores of the Dead Sea, along with Highway 65 on the Jordanian side, at 393 m (1,289 ft) below sea level. A golf course named for Sodom and Gomorrah was built by the British at Kalia on the northern shore. The first major Israeli hotels were built in nearby Arad, and since the 1960s at the Ein Bokek resort complex. Israel has 15 hotels along the Dead Sea shore, generating total revenues of $291 million in 2012. Most Israeli hotels and resorts on the Dead Sea are on a six-kilometre (3.7-mile) stretch of the southern shore. On the Jordanian side, nine international franchises have opened seaside resort hotels near the King Hussein Bin Talal Convention Center, along with resort apartments, on the eastern shore of the Dead Sea. The 9 hotels have boosted the Jordanian side's capacity to 2,800 rooms. On November 22, 2015, the Dead Sea panorama road was included along with 40 archaeological locations in Jordan, to become live on Google Street View. The Palestinian Dead Sea Coast is about 40 kilometres (25 miles) long. The World Bank estimates that a Palestinian Dead Sea tourism industry could generate $290 million of revenues per year and 2,900 jobs. However, Palestinians have been unable to obtain construction permits for tourism-related investments on the Dead Sea. According to the World Bank, Officials in the Palestinian Ministry of Tourism and Antiquities state that the only way to apply for such permits is through the Joint Committees established under the Oslo Agreement, but the relevant committee has not met with any degree of regularity since 2000. View of salt evaporation pans on the Dead Sea, taken in 1989 from the Space Shuttle Columbia (STS-28). The southern half is separated from the northern half at what used to be the Lisan Peninsula because of the fall in level of the Dead Sea. View of the mineral evaporation ponds almost 12 years later (STS-102). A northern and small southeastern extension were added and the large polygonal ponds subdivided. In the early part of the 20th century, the Dead Sea began to attract interest from chemists who deduced the sea was a natural deposit of potash (potassium chloride) and bromine. The Palestine Potash Company was chartered in 1929, after its founder, Siberian Jewish engineer and pioneer of Lake Baikal exploitation, Moses Novomeysky, worked for the charter for over ten years having first visited the area in 1911. The first plant, on the north shore of the Dead Sea at Kalya, commenced production in 1931 and produced potash by solar evaporation of the brine. Employing Arabs and Jews, it was an island of peace in turbulent times. The company quickly grew into the largest industrial site in the Middle East, and in 1934 built a second plant on the southwest shore, in the Mount Sodom area, south of the 'Lashon' region of the Dead Sea. Palestine Potash Company supplied half of Britain's potash during World War II. Both plants were destroyed by the Jordanians in the 1948 Arab–Israeli War. The Dead Sea Works was founded in 1952 as a state-owned enterprise based on the remnants of the Palestine Potash Company. In 1995, the company was privatized and it is now owned by Israel Chemicals. From the Dead Sea brine, Israel produces (2001) 1.77 million tons potash, 206,000 tons elemental bromine, 44,900 tons caustic soda, 25,000 tons magnesium metal, and sodium chloride. Israeli companies generate around US$3 billion annually from the sale of Dead Sea minerals (primarily potash and bromine), and from other products that are derived from Dead Sea Minerals. On the Jordanian side of the Dead Sea, Arab Potash (APC), formed in 1956, produces 2.0 million tons of potash annually, as well as sodium chloride and bromine. The plant is located at Safi, South Aghwar Department, in the Karak Governorate. Jordanian Dead Sea mineral industries generate about $1.2 billion in sales (equivalent to 4 percent of Jordan's GDP). The Palestinian Dead Sea Coast is about 40 kilometres (25 miles) long. The Palestinian economy is unable to benefit from Dead Sea chemicals due to restricted access, permit issues and the uncertainties of the investment climate. The World Bank estimates that a Palestinian Dead Sea chemicals industry could generate $918M incremental value added per year, "almost equivalent to the contribution of the entire manufacturing sector of Palestinian territories today". Both companies, Dead Sea Works Ltd. and Arab Potash, use extensive salt evaporation pans that have essentially diked the entire southern end of the Dead Sea for the purpose of producing carnallite, potassium magnesium chloride, which is then processed further to produce potassium chloride. The ponds are separated by a central dike that runs roughly north-south along the international border. The power plant on the Israeli side allows production of magnesium metal (by a subsidiary, Dead Sea Magnesium Ltd.). Gully in unconsolidated Dead Sea sediments exposed by recession of water levels. It was excavated by floods from the Judean Mountains in less than a year. Since 1930, when its surface was 1,050 km2 (410 sq mi) and its level was 390 m (1,280 ft) below sea level, the Dead Sea has been monitored continuously. In recent decades, the Dead Sea has been rapidly shrinking because of diversion of incoming water from the Jordan River to the north. The southern end is fed by a canal maintained by the Dead Sea Works, a company that converts the sea's raw materials. From a water surface of 395 m (1,296 ft) below sea level in 1970 it fell 22 m (72 ft) to 418 m (1,371 ft) below sea level in 2006, reaching a drop rate of 1 m (3 ft) per year. As the water level decreases, the characteristics of the Sea and surrounding region may substantially change. In May 2009 at the World Economic Forum, Jordan announced its plans to construct the "Jordan National Red Sea Development Project" (JRSP). This is a plan to convey seawater from the Red Sea near Aqaba to the Dead Sea. Water would be desalinated along the route to provide fresh water to Jordan, with the brine discharge sent to the Dead Sea for replenishment. Israel has expressed its support and will likely benefit from some of the water delivery to its Negev region. At a regional conference in July 2009, officials expressed concern about the declining water levels. Some suggested industrial activities around the Dead Sea might need to be reduced. Others advised environmental measures to restore conditions such as increasing the volume of flow from the Jordan River to replenish the Dead Sea. Currently, only sewage and effluent from fish ponds run in the river's channel. Experts also stressed the need for strict conservation efforts. They said agriculture should not be expanded, sustainable support capabilities should be incorporated into the area and pollution sources should be reduced. Sources: Israel Oceanographic and Limnological Research, Haaretz, Jewish Virtual Library, Jordan Valley Authority. In October 2009, the Jordanians announced accelerated plans to extract around 300 million cubic metres (11 billion cubic feet) of water per year from the Red Sea, desalinate it for use as fresh water and send the waste water to the Dead Sea by tunnel, despite concerns about inadequate time to assess the potential environmental impact. According to Jordan's minister for water, General Maysoun Zu'bi, this project could be considered as the first phase of the Red Sea–Dead Sea Water Conveyance. In December 2013, Israel, Jordan and the Palestinian Authority signed an agreement for laying a water pipeline to link the Red Sea with the Dead Sea. The pipeline will be 180 km (110 mi) long and is estimated to take up to five years to complete. In January 2015 it was reported that the level of water is now dropping by 1 m (3 ft) a year. On 27 November 2016, it was announced that the Jordanian government is shortlisting five consortiums to implement the project. Jordan's ministry of Water and Irrigation said that the $100 million first phase of the project will begin construction in the first quarter of 2018, and will be completed by 2021. ^ a b c "Virtual Israel Experience: The Dead Sea". Jewish Virtual Library. Retrieved 21 January 2013. ^ a b "The Dead Sea Is Dying Fast: Is It Too Late to Save It, or Was It Always a Lost Cause?". Haaretz. 7 October 2016. Archived from the original on 22 December 2016. ^ a b c Dead Sea Data Summary 2015.Water Authority of Israel. World Bank.org/WBSITE/EXTERNAL/COUNTRIES/MENAEXT/EXTREDSEADEADSEA/0,,contentMDK:21827416~pagePK:64168427~piPK:64168435~theSitePK:5174617,00.html The World Bank - 'The Red Sea - Dead Sea Water Conveyance Study Program' - 2013 Archived 2013-09-15 at the Wayback Machine. ^ a b c d "Long-Term changes in the Dead Sea". Israel Oceanographic and Limnological Research - Israel Marine Data Center (ISRAMAR). ^ a b The first article al- is unnecessary and usually not used. ^ "Israel and Jordan Sign 'Historic' $900 Million Deal to Save the Dead Sea". Newsweek. ^ Goetz, P. W., ed. (1986). "Dead Sea". The New Encyclopædia Britannica. 3 (15th ed.). Chicago. p. 937. ^ R W McColl, ed. (2005). Encyclopedia of world geography. Facts on File. p. 237. ISBN 9780816072293. ^ "Dead Sea - Composition of Dead Sea Water". Archived from the original on 2013-11-04. ^ a b "5 alliances shortlisted to execute Red-Dead's phase I". The Jordan Times. 27 November 2016. Retrieved 3 December 2016. ^ David Bridger; Samuel Wolk (September 1976). The New Jewish Encyclopedia. Behrman House, Inc. p. 109. ISBN 978-0-87441-120-1. Retrieved July 25, 2011. It was named the “Dead Sea” because of the fact that no living thing can exist there, since the water is extremely salty and bitter. ^ See bitumen and asphalt for more about asphaltite. ^ "Springs and quicksand at the Dead Sea". Retrieved August 27, 2008. ^ "Mujib". UNESCO. Retrieved 7 May 2016. ^ "Dead Sea". Exact Me.org. Archived from the original on January 20, 2013. Retrieved January 21, 2013. ^ a b c Mordechai Stein. "The limnological history of late Pleistocene – Holocene water bodies in the Dead Sea basin" (PDF). Archived from the original (PDF) on 2013-05-13. ^ a b Uri Kafri; Yoseph Yechieli (2010). Groundwater Base Level Changes and Adjoining Hydrological Systems. Springer Science & Business Media. p. 123. ISBN 978-3642139444. ^ Geochemical Society; Meteoritical Society (1971). Geochimica et Cosmochimica Acta. Pergamon Press. Retrieved April 12, 2011. ^ "Natural Resources". Dead Sea Research Center. Retrieved 27 October 2013. ^ "Lowest Elevation: Dead Sea". Extreme Science. Retrieved May 22, 2007. ^ "Climatological Averages for Dead Sea". IMS. Archived from the original on June 7, 2011. Retrieved June 9, 2011. ^ "Averages and Records for several places in Israel". Israel Meteorological Service. June 2011. Archived from the original on 2010-09-14. ^ a b "Dead Sea Canal". American.edu. 1996-12-09. Archived from the original on May 22, 2009. Retrieved May 5, 2009. ^ Bein, A.; O. Amit (2007). "The evolution of the Dead Sea floating asphalt blocks: simulations by pyrolisis". Journal of Petroleum Geology. 2 (4): 439–447. Bibcode:1980JPetG...2..439B. doi:10.1111/j.1747-5457.1980.tb00971.x. Archived from the original on 2013-01-05. ^ J. Rullkötter; A. Nissenbaum (December 1988). "Dead sea asphalt in Egyptian mummies: Molecular evidence". Naturwissenschaften. 75 (12): 618. Bibcode:1988NW.....75..618R. doi:10.1007/BF00366476. ^ "Asthma, Cystic Fibrosis, Chronic Obstructive Lung Disease". Dead Sea Research Center. Retrieved May 22, 2007. ^ Cohen, Arnon D.; Van‐Dijk, Dina; Naggan, Lechaim; Vardy, Daniel A. (2005). "Effectiveness of climatotherapy at the Dead Sea for psoriasis vulgaris: A community-oriented study introducing the Beer Sheva Psoriasis Severity Score". Dermatological Treatment. 16 (5–6): 308–313. doi:10.1080/09546630500375841. PMID 16428150. ^ S. Halevy; et al. "Dead sea bath salt for the treatment of psoriasis vulgaris: a double-blind controlled study". 9 (3). Journal of the European Academy of Dermatology and Venereology: 237–242. ^ Michael Friedman; Ramakrishnan Vidyasagar; Ninos Joseph (June 2006). "A Randomized, Prospective, Double-Blind Study on the Efficacy of Dead Sea Salt Nasal Irrigations". The Laryngoscope. 116 (6): 878–882. doi:10.1097/01.mlg.0000216798.10007.76. PMID 16735920. ^ Flusser, Daniel; Abu-Shakra, Mahmoud; Friger, Michael; Codish, Shlomi; Sukenik, Shaul (August 2002). "Therapy With Mud Compresses for Knee Osteoarthritis: Comparison of Natural Mud Preparations With Mineral-Depleted Mud" (PDF). 8 (4). Journal of Clinical Rheumatology: 197–203. Archived from the original (PDF) on 2011-08-16. ^ Ionescu, Danny; Siebert, Christian; Polerecky, Lubos; Munwes, Yaniv Y.; Lott, Christian; Häusler, Stefan; Bižić-Ionescu, Mina; Quast, Christian; Peplies, Jörg; Glöckner, Frank Oliver; Ramette, Alban; Rödiger, Tino; Dittmar, Thorsten; Oren, Aharon; Geyer, Stefan; Stärk, Hans-Joachim; Sauter, Martin; Licha, Tobias; Laronne, Jonathan B.; De Beer, Dirk (2012). "PLOS ONE". PLOS ONE. 7 (6): e38319. doi:10.1371/journal.pone.0038319. PMID 22679498. ^ "Asphaltites examples from ancient sources". Wordnik.com. Retrieved 2013-08-22. ^ Hadas, Gideon (April 2011). "Dead Sea Anchorages". Revue Biblique. 118 (2): 161–179. JSTOR 44092052. ^ Josephus, Antiquities of the Jews 18.119[permanent dead link]. ^ Josephus. "9". Antiquities of the Jews. 1. ^ "Sodomite salt could cause blindness". Archived from the original on 2009-08-15. ^ "History of the Dead Sea - Discover the Dead Sea with Us!". 1 July 2016. ^ "'The unfortunate Costigan', first surveyor of the Dead Sea". 25 February 2013. ^ "Dead Sea, Aqaba hotels packed during Eid Al Fitr holiday". The Jordan Times. 10 July 2016. Retrieved 12 July 2016. ^ a b Jacob Norris (11 April 2013). Land of Progress: Palestine in the Age of Colonial Development, 1905-1948. OUP Oxford. pp. 159–. ISBN 978-0-19-966936-3. ^ "Wealth From The Dead Sea". Popular Mechanics. Chicago: Hearst Magazines. 54 (5): 794–798. November 1930. ^ Hurlbert, Stuart H. (6 December 2012). Saline Lakes V: Proceedings of the Vth International Symposium on Inland Saline Lakes, held in Bolivia, 22–29 March 1991. Springer Science & Business Media. ISBN 9789401120760 – via Google Books. ^ Schechter, Asher (14 April 2013). "Who Really Owns the Dead Sea?" – via Haaretz. ^ "Overview of Middle East Water Resources_Dead Sea". Jewish Virtual Library. December 1998. Retrieved 31 May 2014. ^ C. Klein; A. Flohn. Contribution to the Knowledge in the Fluctuations of the Dead Sea Level. 38. Theoretical and Applied Climatology. pp. 151–156, 1987. ^ M. Abelson; Y. Yechieli; O. Crouvi; G. Baer; D. Wachs; A. Bein; V. Shtivelman (2006). Evolution of the Dead Sea Sinkholes in. special paper 401. Geological Society of America. pp. 241–253. 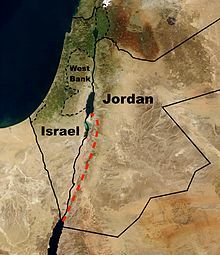 ^ "Jordan, Israel agree $900 million Red Sea-Dead Sea project". Reuters. 26 February 2015. Retrieved 11 December 2018. ^ Ehud Zion Waldoks (July 8, 2009). "Back from the Dead?". The Jerusalem Post. Archived from the original on October 27, 2013. ^ "Water level of the Dead Sea". Jewish Virtual Library. Retrieved 31 May 2014. ^ "Water level and surface area of the Dead Sea". Jewish Virtual Library. Retrieved 31 May 2014. ^ Eng. Sa’ad Abu Hammour, JVA. "River Basin Management" (PDF). Jordan Valley Authority. Archived from the original (PDF) on 2014-05-31. Retrieved 31 May 2014. ^ "Jordan to refill shrinking Dead Sea". Daily Telegraph. 10 October 2009. ^ Sherwood, Harriet (2013-12-09). "Dead Sea neighbours agree to pipeline to pump water from Red Sea". The Guardian. ^ Catholic Online. "Dead Sea Dying: Levels of salt water are dropping by three feet annually". ^ "The Dead Sea : Image of the Day". The World Bank, 2013, "The Red Sea - Dead Sea Water Conveyance Study Program", and source of basic data on the Dead Sea. Niemi, Tina M., Ben-Avraham, Z., and Gat, J., eds., 1997, The Dead Sea: The Lake and Its Setting: N.Y., Oxford University Press, 286 p.
This page was last edited on 6 April 2019, at 21:50 (UTC).